It’s standard practice at the DMV to ask this question of anyone renewing their license. 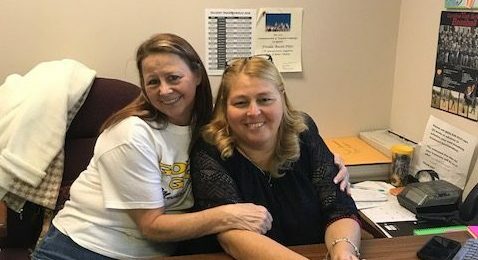 Sandy Bloxom and Frieda Booth-Pitts asked the organ donation question countless times during their lengthy tenure at the Henrico DMV office, never knowing they would be personally impacted. But that changed in early June 2017, when Sandy gave Frieda her kidney. Sandy Bloxom and Freida Booth-Pitts are coworkers at the Virginia DMV. Freida had known for more than a decade that her kidneys were in trouble. During her annual check-up 15 years ago, her doctor saw that her kidney levels weren’t good and sent her to a nephrologist at what was then the Medical College of Virginia (now VCU Health System). By 2015, she needed a new kidney and she was added to the donor waiting list. It wasn’t a secret – she talked to friends and relatives about it and especially to the DMV customers as she encouraged them to check the organ donor box on their driver’s license forms. She also mentioned it to Sandy. 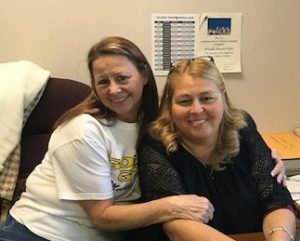 The two women are both assistant managers in different Henrico branches and they’ve known each other for about six years. “We were at a manager’s meeting and Freida and I went to lunch and she said she was on the donor list to get a new kidney and I said ‘Oh, I’ll try to donate one to you,’”Sandy said. And just like that, during a casual conversation between coworkers over lunch, it began. Sandy wasn’t just being polite – she meant it. 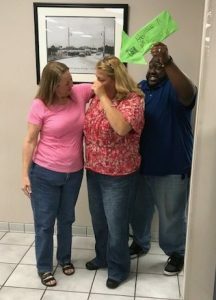 A couple weeks after their lunchtime chat, she went in for testing and found out she was a perfect match – so perfect, the two could have been close relatives. Everything was great … except forSandy’s lungs. The news was a hard blow. Over the next few months, Freida’s health declined. She had emergency open-heart surgery and pneumonia and her kidney function got so bad that she had to go on dialysis. By the spring of 2017, she was spending nine hours at a time hooked up to the dialysis machine before going into work every morning at 7:30 a.m. But the home dialysis wasn’t as bad as being in the hospital watching the other kidney patients. For Sandy, the heartbreaking part was watching her friend struggle as she got sicker and sicker. But unbeknownst to Freida, Sandy hadn’t given up. After she was rejected because of her lungs, she quit smoking so she could try again. In early 2017, eight months after quitting, she asked to have her lungs retested. It worked – her lungs tested at 89% capacity and she was approved as a donor. She didn’t tell Freida though. Freida didn’t even know she’d quit smoking. Sandy’s daughter, Ashley, also works at DMV with Freida and throughout the long wait, Ashley kept her mother’s secret while keeping Freida’s spirits up. Ashley was right. On May 26, Freida was at work when her manager called for attention to make an announcement. Freida didn’t pay it much mind – there are a lot of announcements at DMV. Sandy and Freida were set to go in for surgery on June 5 – only a week-and-a-half later. Sandy tells Freida she is a match and has been accepted as a donor. 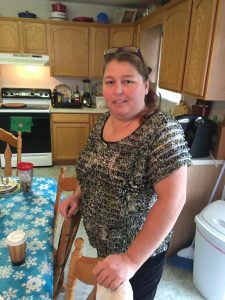 Sandy’s kidney took about a week to start functioning correctly inside Freida but since then, everything has been good for both women. Surgery took place on a Monday and Sandy was released from the hospital that Wednesday. But she didn’t go back to work right away. She didn’t have to. Virginia state employees who donate an organ get six weeks of paid leave, Sandy explained. That doesn’t come out of their personal or sick leave banks – it’s an extra benefit provided by the state to organ donors. Sandy didn’t have to pay for anything, either, Freida said, and that’s a point she makes to DMV customers who don’t want to check the box. When Freida was waiting for a kidney, she told her story to customers every day. Two of them went right out to be tested as donors and when they weren’t matches for Freida, they each donated a kidney in her name to move her up the donor list. Freida now wears a Donate Life Virginia organ recipient pin at work, which invites questions from customers. She tells her story and some people still don’t check the box, but a lot of them do, she said. Sandy shares the message in her branch as well, especially highlighting the fact that donors don’t pay a dime and that some employers – like the Commonwealth of Virginia – donate all of the recovery time as paid leave.